FOXBOROUGH — Stop me if you’ve heard this before: There is a bearded No. 50 on the Patriots’ defense who has an uncanny knack for being in the right spot at the right time, and represents all that’s right with the gridiron gestalt spouted by the folks in Fort Foxborough. It’s hard to believe, but the current No. 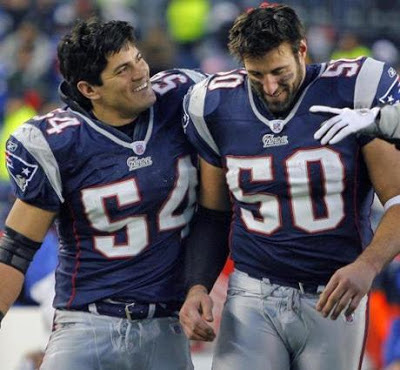 50, Rob Ninkovich, has never met his hirsute forerunner, Mike Vrabel. Yes, he will. For eight seasons, Vrabel, now a defensive line coach at his alma mater, Ohio State, was one of the pillars of the Patriot Way. His instinctiveness on the field was matched only by his caustic wit off it. No one was safe from Vrabel’s verbal jabs, Tom Brady, media members, not even Patriots coach Bill Belichick. If he hadn’t been an NFL linebacker, Vrabel would have killed as a stand-up comic. Vrabel’s game was no laughing matter, though. He was the perfect Patriot, versatile, reliable, accountable. You can say the same for the more mild-mannered Ninkovich, who led the Patriots in sacks this season with eight and tied for the team lead in forced fumbles (five) and fumble recoveries (four). The self-effacing defensive end isn’t Vrabel, who won three rings with the Patriots. But Ninkovich is doing a valid Vrabel imitation in helping the Patriots reach Sunday’s AFC Championship game against the Ravens. His interception last Sunday against the Texans was a Vrabel-esque display of instinct, execution, and athleticism. One of the great travesties of the Patriots’ run last decade was that Vrabel only went to one Pro Bowl, in 2007, when he had 12½ sacks, still the most of any Patriots player in the Belichick era. The 28-year-old Ninkovich isn’t in Vrabel’s class yet, but he is what every eventual championship team needs. He is a Glue Guy. A Glue Guy is not a captain, but he is a leader. He is not a Pro Bowler, but he is a playmaker. He is not a household name, but the opposing team is certainly familiar with him. You’re going to hear a lot this week in the lead-up to the AFC title tilt at Gillette Stadium about Brady, Wes Welker, Vince Wilfork, and Devin McCourty for the Patriots, and Joe Flacco, Ray Rice, Ray Lewis, and Ed Reed for the Ravens. But it’s guys like Ninkovich who often make the difference in a game like Sunday’s. They’re guys who are underappreciated, but not undervalued, at least not by their coaches and teammates. You won’t see them on ESPN “SportsCenter” commercials, but you will see them showing up on the game tape week in and week out. “He makes plays. [Rob] always seems to be in the right place at the right time,” said linebacker and defensive captain Jerod Mayo. Comparisons are inevitable in sports. They’re part of what makes it fun. They’re the guy wire that connects yesteryear with today. Players usually don’t welcome or enjoy them. Ninkovich is no different. He understands that Vrabel’s name is a hallowed one in the halls of Gillette Stadium. Ninkovich has a football fairy tale of his own, though. He entered the league as a fifth-round pick out of Purdue in 2006 and was cut four times before he landed with the Patriots in the summer of 2009. His last team, the Saints, had decided that Ninkovich’s football calling wasn’t as a defensive end, but as a long-shot long-snapper. That’s right. The Patriots’ leading sacker is a former long-snapper. This stuff only happens for the Hoodie. Ninkovich became a semi-regular for the Patriots in 2010. In the last two seasons, he has started every game the Patriots have played, all 36 of them, including the postseason. The similarities between Ninkovich and Vrabel, who was traded to the Chiefs along with Matt Cassel in 2009, invite a Patriot parallel. They wear the same number, have the same scant use of a razor, and both went to Big Ten schools. Ninkovich even played some tight end in college, catching two touchdown passes. Vrabel, of course, moonlighted at tight end for the Patriots and all 12 of his career receptions went for touchdowns, including a pair of Super Bowl scores. Mayo, who was a rookie in Vrabel’s final year with the Patriots, 2008, didn’t want to get into a Ninkovich-Vrabel comparison. But he said that Ninkovich is the type of guy that you want to play with. No, Ninkovich is not Vrabel. But the Patriots are in the AFC title game and a No. 50 on the New England defense is making clutch plays and sacrificing himself for the team. There’s something comforting about that.